The wonderful part of camphosting that I love the most is getting to meet lots of really nice friends. I met John and Jean who waved to me to join them at their picnic table one evening after I made my rounds. 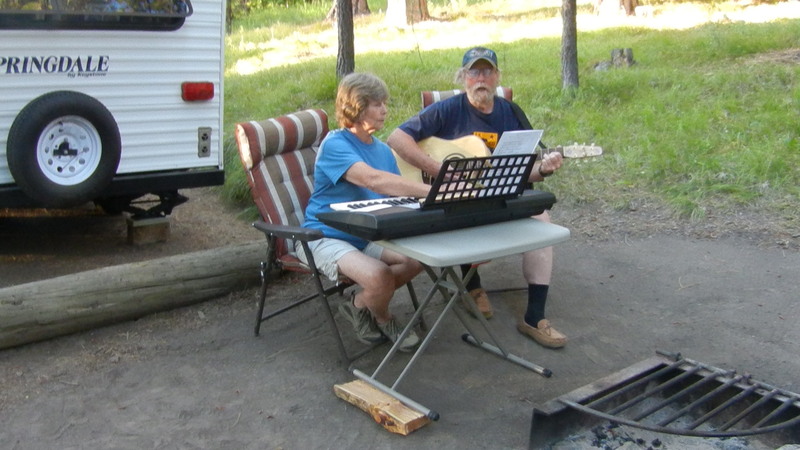 They were from Bend, OR and been coming to this campgrounds for 35 years. They always stayed in site #15 since it has a small creek running through the back of the site. They would bring their kids who would play in the stream. Now of course the kids are grown, but they always make a point of coming back here every year. We got to talking about all the cyclists that stop at this campground and they related the story about how for many years they used to follow cyclists with food, tents and other gear. Of course these were cyclists that had a great deal of money and could afford to have all their gear transported for them. John and Jean would go ahead, set up camp and prepare all their meals. Then feed them breakfast tear down the tents, purchase more food, set up the tents and prepare the evening meal. This would go on day after day. What an experience! Also camped not far from John and Jean on the same weekend were Bob and Stacey. I met them as they were walking around the campground. Bob is a long distance truck driver and has a many stories to tell about his trucking adventures (especially hauling the pigs). He is a very funny guy. Both Bob and Stacey are really nice down to earth people. While I was talking with them John and Jean came by and also joined in the conversation. What a blast! 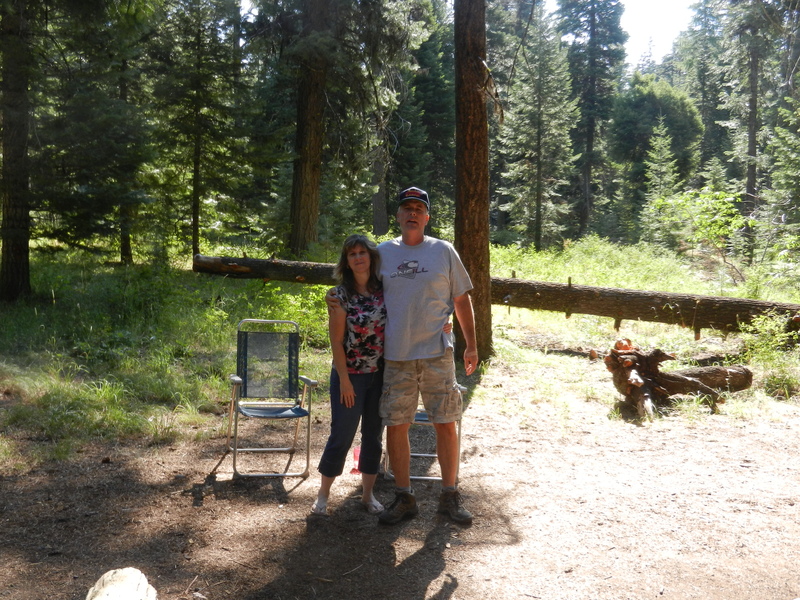 This past weekend Bob and Stacey came down again and stayed for 3 nights. We got together each day and laughed and laughed! It was really a fun weekend. One of the days they drove to an Orchard and brought me some fresh peaches, nectarines and cherries. YUM! YUM! They were so juicy!! Here is a pic of Bob and Stacey before they left for home. Thanks everyone! I really enjoyed you letting me be part of your weekends. In between weeks I met John and Kim while making my rounds. They had their musical instruments out and were playing some really sweet music. John plays at the Prineville Eagles Club on Friday nights so if you are in the area at that time be sure and stop in and don’t forget to tell him Jimbo from Ochoco Divide says “Howdy”. I took a movie of them playing one of the songs he had written but the internet takes way too long to upload it. They were really fun people and John offered to show me around Prineville when I get down there again. 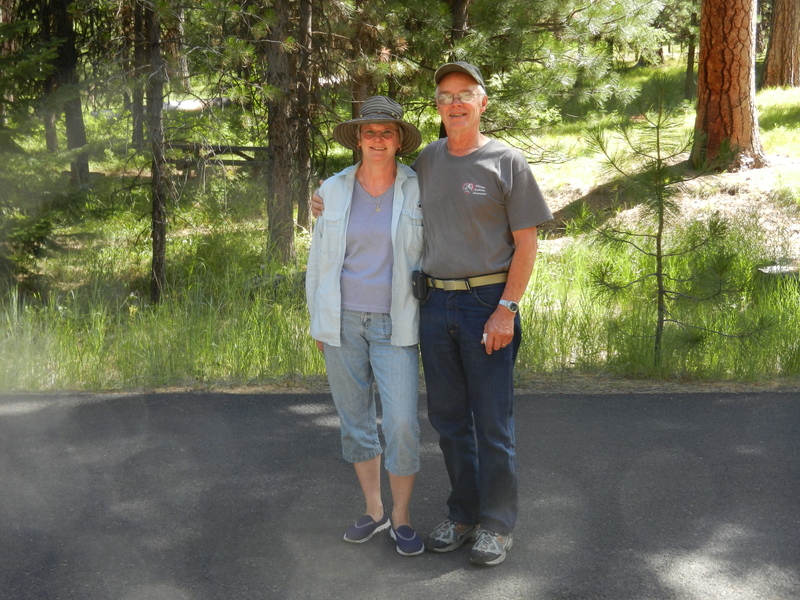 These are just a few of the many wonderful people that I have met during my stay at Ochoco Divide Campground. I have met people from all over the world in this little paradise in the Ochoco Mountains. That is really one of the best benefits of this job. This entry was posted in My Friends, Ochoco Divide Campground, Ochoco Mountains, Ochoco National Forest, Oregon, Prineville by Jim Melvin. Bookmark the permalink. Nice. Meeting folks and hearing their stories is so much fun. Enjoy. Great post Jim. I can see that this has been a terrific camp host position for you this summer. You have met so many interesting people and I have enjoyed reading about them. I think you get to meet so many nice folks because you are friendly yourself. That makes for a great camphost. We’ve enjoyed reading about all the interesting people you’ve met this summer. Sounds like a fun job. really cool that you have met so many people that you may never of met unless on this journey!